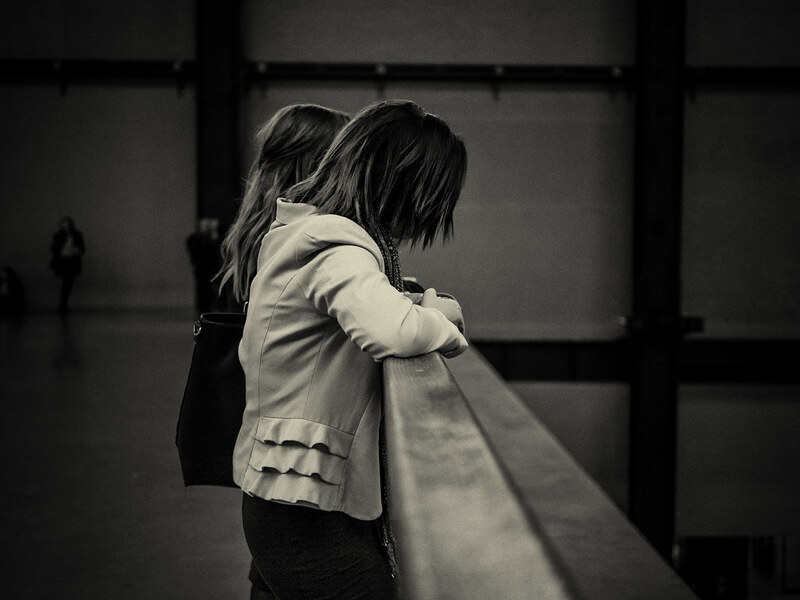 This week I visited the Tate Modern. 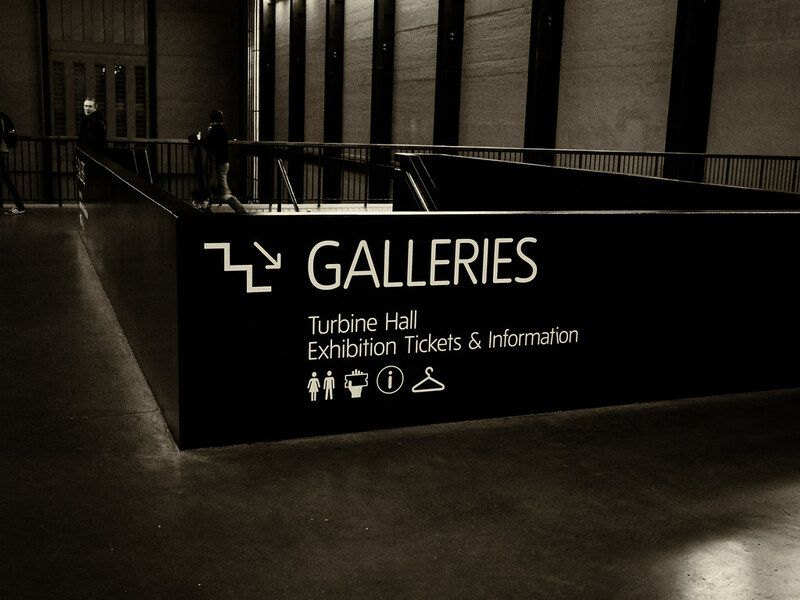 The former Bankside Power Station was selected as a new gallery site by the Tate trustees in 1994. The iconic power station, built in two phases between 1947 and 1963, was designed by Sir Giles Gilbert Scott. In 1996 the design plans were unveiled and the site was purchased and work began. The huge machinery was removed and the building was stripped back to its original steel structure and brickwork. 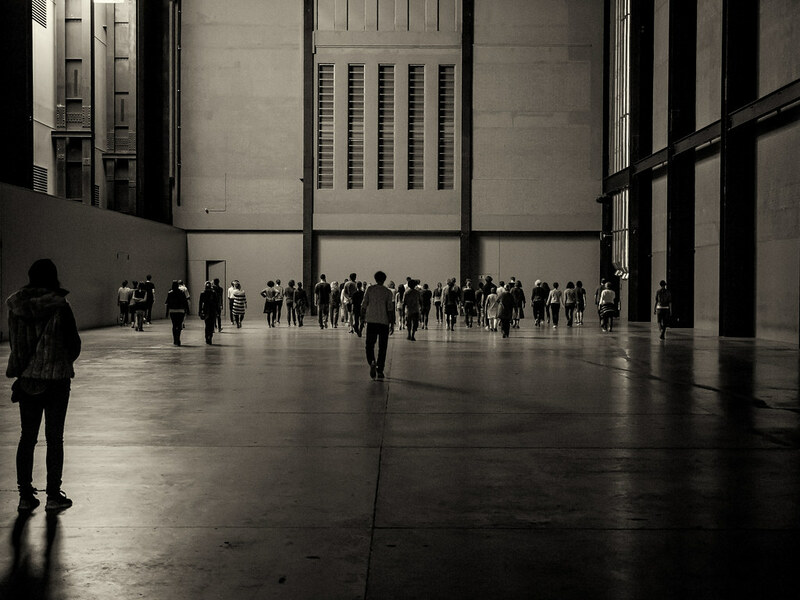 The turbine hall became a dramatic entrance and display area and the boiler house became the galleries. 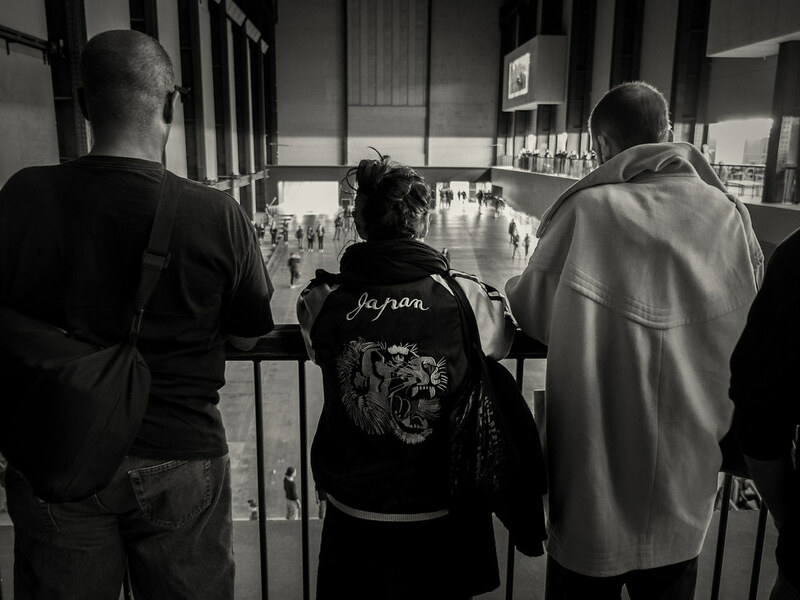 Since it opened in May 2000, more than 40 million people have visited Tate Modern. 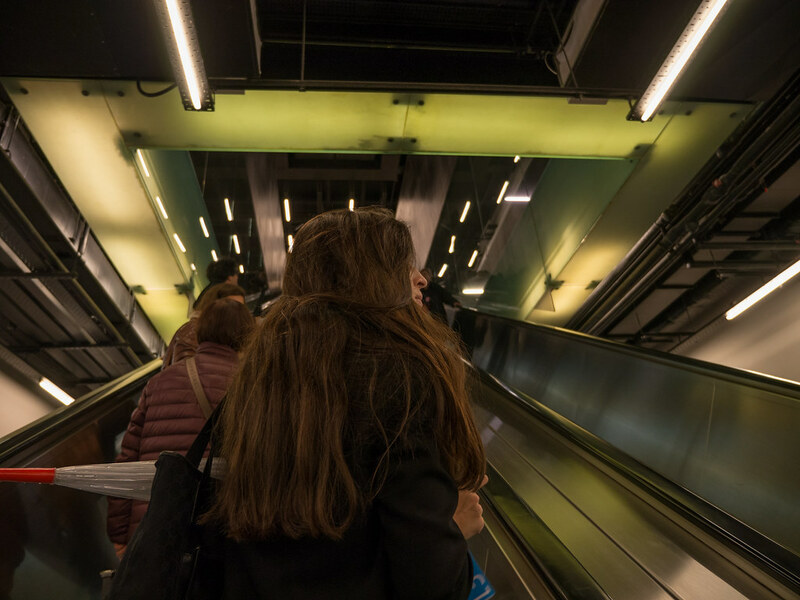 It is one of the UK’s top three tourist attractions. 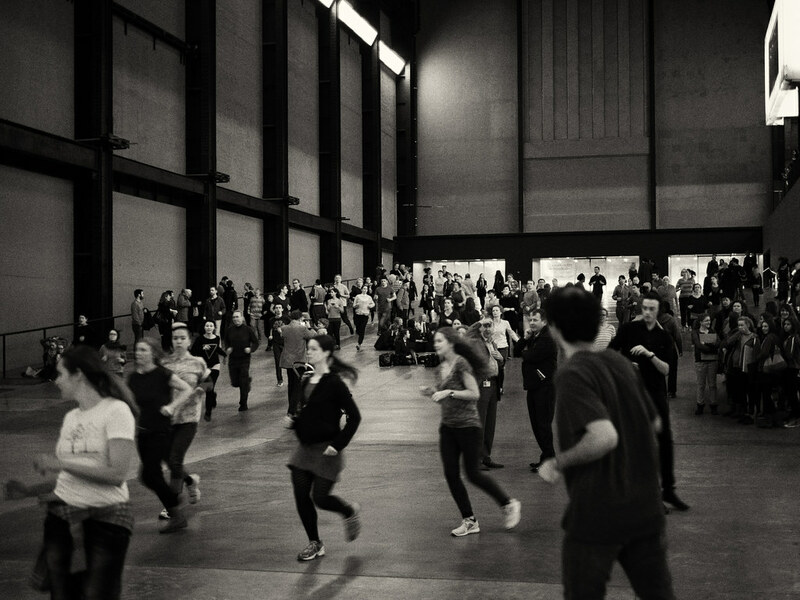 I intended to visit a new live commission, These associations, created by Anglo-German artist Tino Sehgal. 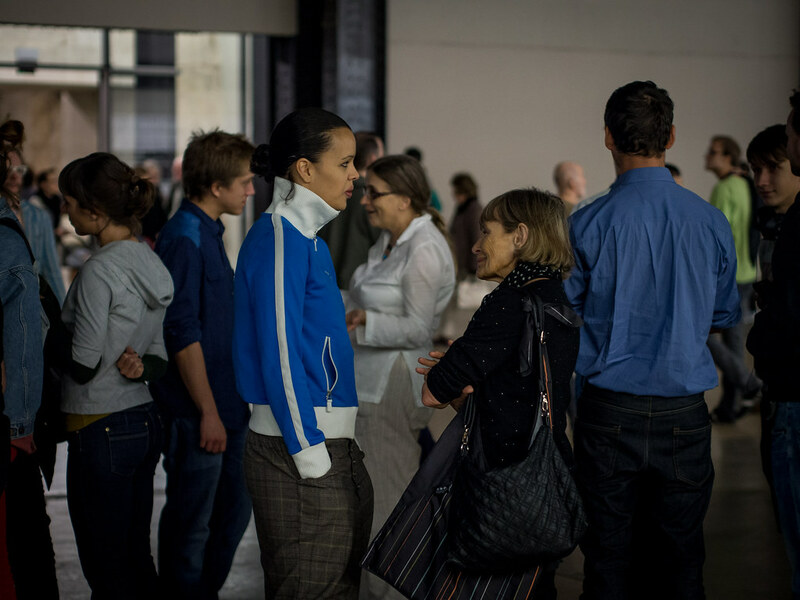 Tino Sehgal has risen to prominence for his innovative works which consist purely of live encounters between people. 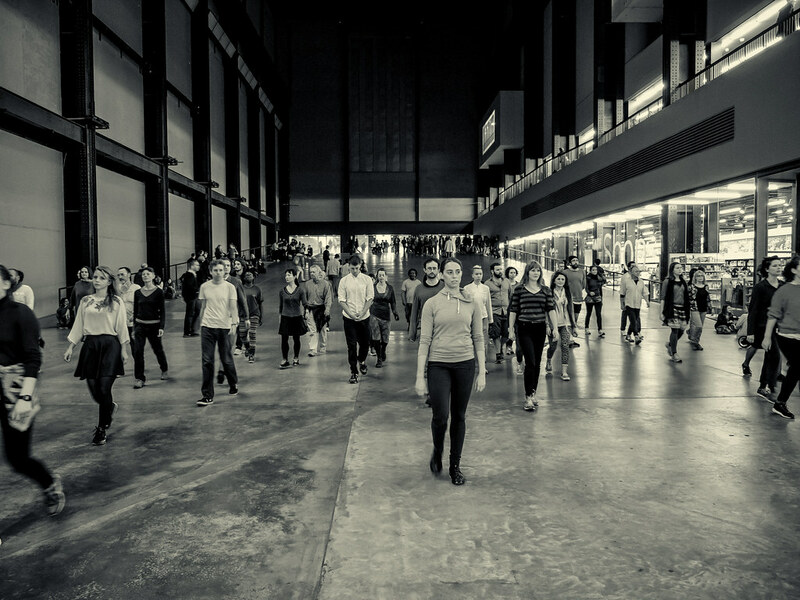 Tate Modern’s Turbine Hall is inhabited by an assembly of participants whose choreographed actions use movement, sound, and conversation. 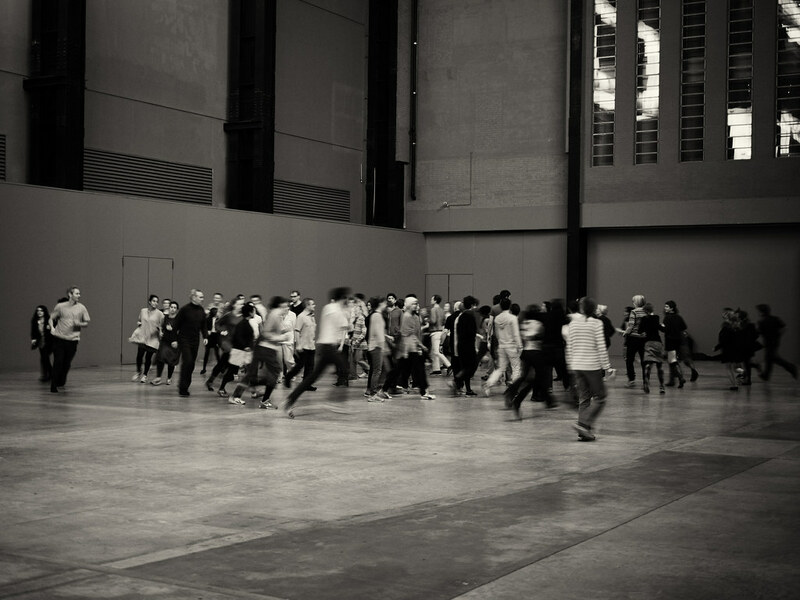 The Turbine Hall is occupied by the physical and vocal energy of the participants and visitors. 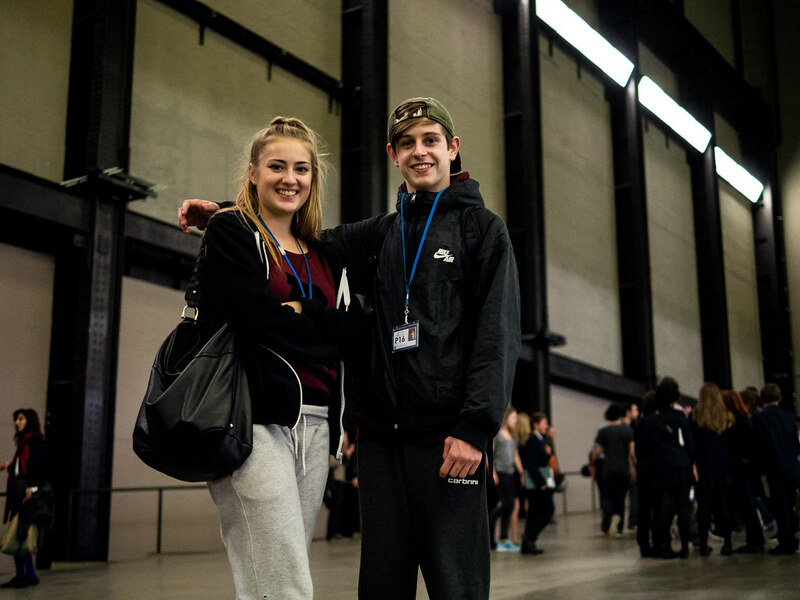 Personally, I was surprised when one of the performers came to talk to me about her son and the fact he plays loud music on his electric guitar! 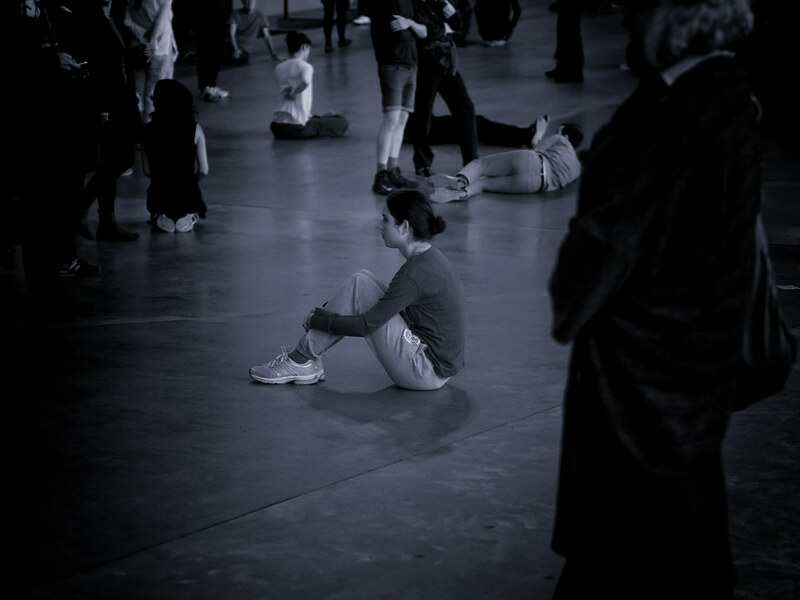 It was an amazing work and spectacle and was well received by all sorts of visitors. Taken with my Panasonic G5 and Olympus E-M5, 12-35mm, 25mm, and 45mm lenses. This was another interesting comparison of the E-M5 and G5. 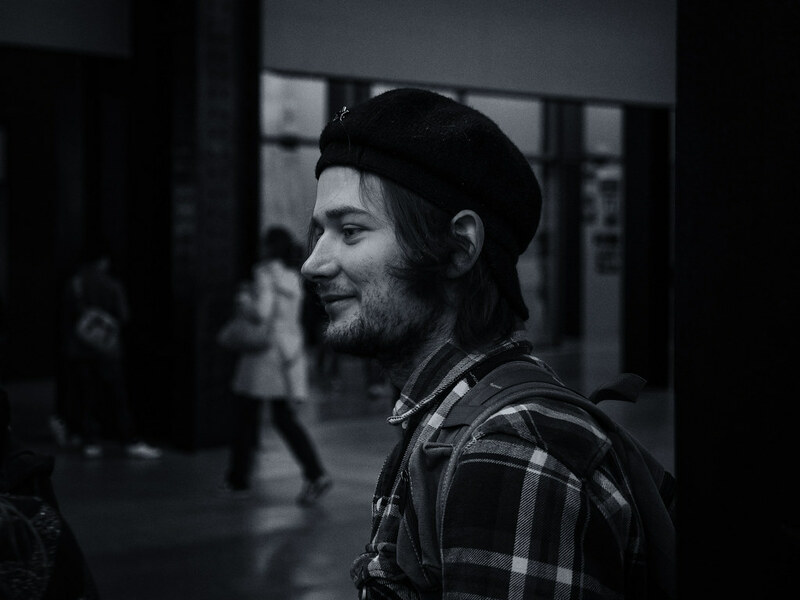 The E-M5 performed better at high ISOs and was generally easier to use in these conditions. The fact I could rely upon the E-M5’s IBIS to use the 45mm F1.8 and 25mm F1.4 PL lens was a huge advantage, whereas I was basically limited to using the 12-35mm with the G5 (because it has OIS). Stabilisation is hugely important in these conditions. Nonetheless, I really enjoyed using the G5 and was able to coax some great pictures out of it. Your photos are beautiful. Thank you for sharing them. 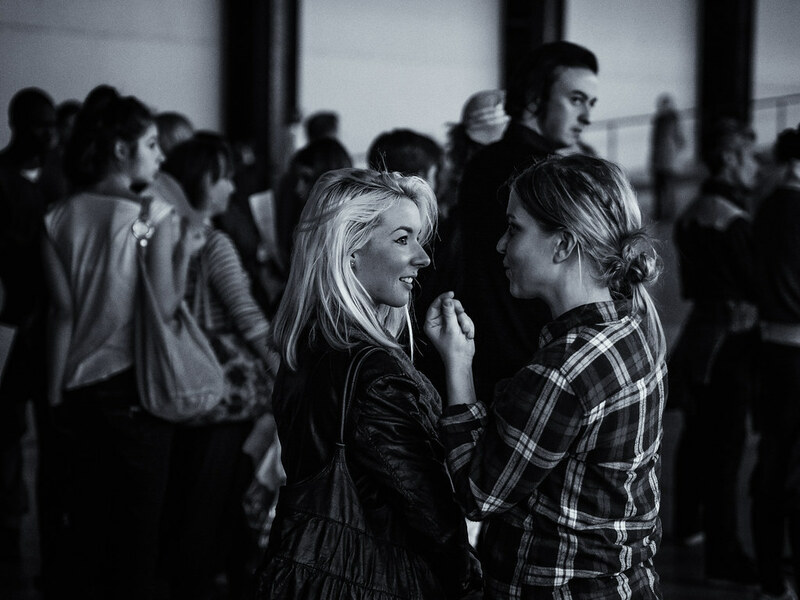 I am one of the people in These Associations and would like to share your pictures with others… may I? With permission and credit given, of course. Jen, I’m glad you liked them, I very much enjoyed coming to watch These Associations. I’m fine with you sharing the pictures as long as you include a link to my blog post. Simon, you are a generous and wonderful individual. Thank you kindly. 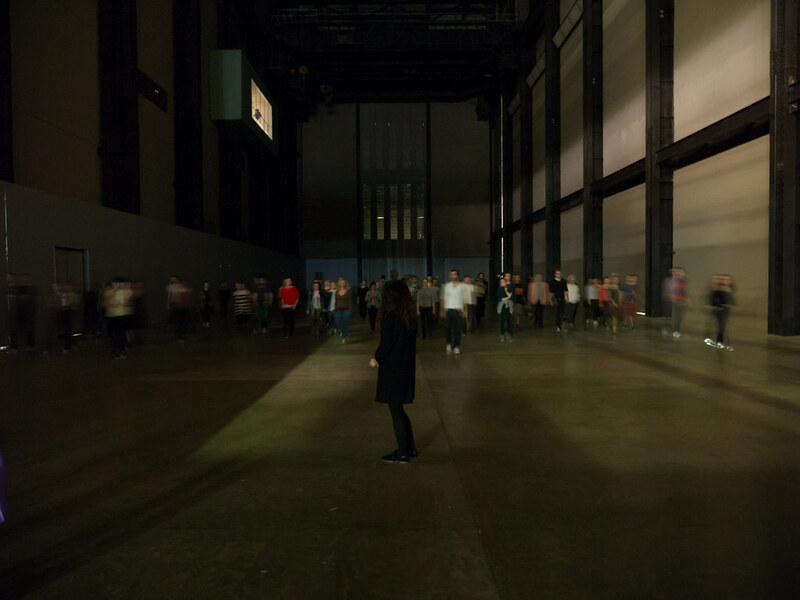 Simon, I was one of the participants at the Tate Modern. 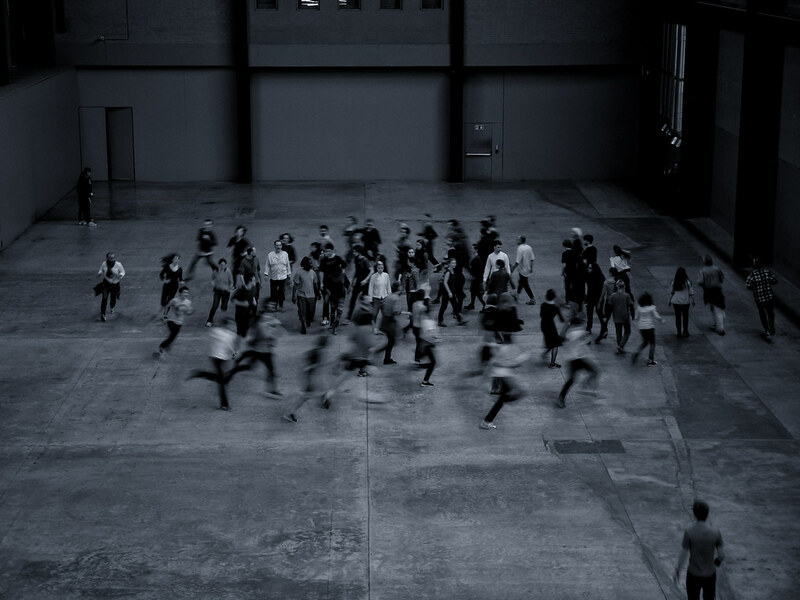 Your photo of the circular swarming captures the piece better than any other image i’ve seen. I would love to make a print for my wall and wonder if you would be willing to send me the highest res digital file. I would be happy to pay you for it. In this case I’m fine to send you a file for your personal use and printing. If you can confirm the file name of the picture concerned (I thought it was probably P1010381 (you can see the file names by hovering over the photo)) I’ll drop you a link with a link to where the original file is hosted.